This paper describes the development of Pictorial Conceptual Metaphors, a pictorial outcome of systemic action research that captures and explains complex systems from the perspectives of the participants involved. The Pictorial Conceptual Metaphors presented in this paper developed from the authors’ work on a literature review for the Indigenous Health and Wellbeing Node of NIRAKN. In this paper, the authors provide an overview of the theories that influenced their development of Pictorial Conceptual Metaphors, including systems theory, soft systems thinking, visual metaphor theory, and the ecosciences approach of pictorial conceptual models. They work from a systemic action research perspective, and argue that Pictorial Conceptual Metaphors provide a powerful way of ‘seeing the system’, understanding a system within its historical context, and developing a catalyst for systemic change. 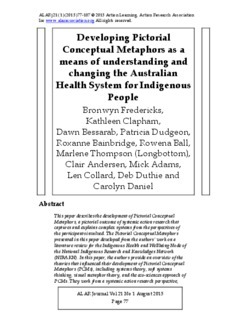 They propose that Pictorial Conceptual Metaphors can be used to enhance understandings and encourage conversations about the change needed in complex systems such as Australia’s health system, in a way that is culturally respectful and appropriate for Indigenous Australians.